Thirumaḻisai Āḻvār was chronologically the fourth of the 12 Āḻvārs, who has been living right between Peyāḷvar and Nammāḷvār. The actual time of his life is unknown, as with most of the Āḻvārs and the ancient history of India in general – it is rather mythological as historical in our contemporary understanding, and so is his life – rather a marvellous story with many wanders and miracles. However – it may be, that our beloved Āḻvārs have indeed lived in a completely another, more spiritually developed civilization and conditions, were it all indeed could easily take place. The name of Thirumaḻisai Āḻvār comes from his birthplace, Thirumaḻisai, a suburb in modern day Chennai. - or following the arrows in bottom of page, as usual. He was born to Mahā-Ṛiṣi Bhārgava and his wife Kanakangi after an unusual 12 months stay in the womb. Seeing the foetus that came out as just a lifeless lump of flesh with no arms, legs, etc., they were terribly depressed and with unwillingness left it at the foot of a bush of cane shrubs in the forest and proceeded on their spiritual journey. Our Lord Śrīman Nārāyaṇa appeared with His consort and blessed the "flesh" with Their divine vision and it turned into an alive, divine energy, became fully developed into a lovely baby. A childless tribal couple called Tiruvālan and Pankaya Chelvi engaged in cutting canes found the child and took it home. However, the child would not eat or drink anything nor did it show any signs of expelling waste material from its body. The foster-parents really longed to see the baby drink or eat something; It has been continuing for quite some time and this unusualness news spread everywhere and attracted lots of people to see and be blessed with the darśan of this divine child, who is growing and developing like any other normal child without absolutely any intake. One day, the couple drank of the milk left over by the child. They regained youth and in due course had a son born to them whom they named as 'Kanikaṇṇaṉ'. It was a miracle by the Divine Āḻvār, who was none other as incarnation of Sudarśana Chakra, the tool of Mahā-Viṣṇu. Thirumaḻisai decided to learn about all other religions. He studied Buddhist, Jain and other scriptures. He became a staunch devotee of Śiva assuming the name of Śiva Vākya. One day, he saw an old man planting a plant upside down and then trying to water it with a broken pot using a tattered rope to lift water from a waterless well. Śiva-vākya asked him why he was attempting such a foolish act. The old man was none other than Peyāḷvar who replied that what he was doing was only less foolish than Śiva-vākya's allegiance to Śaivam, knowing full well that the Vedas and Smṛiti proclaim Śrī Nārāyaṇa as the Supreme deity. "After my futile efforts to know the supreme principle through Jainism, Buddhism, and Śaiva philosophy, I am blessed by Śrīman Nārāyaṇa to take refuge at the Lotus feet of Śrī Devi and have escaped all problems and misfortunes since then." Thirumaḻisai visited various sthalas (temples) and came to Kānchīpuram and was allured by the beauty of the Lord and the scenic beauties and decided to stay there for some time. Our Kanikaṇṇaṉ, who was grown up during these times, also joined Thirumaḻisai and served him as an ardent disciple (śiṣya) to Āḻvār. The old lady was moved and regretted that she joined him at this age only and not when she was able so that she could have continued to serve for more years. Hearing that, Āḻvār's kind heart melted and showered his graceful look (kaṭākṣa) on the lady, who was immediately transformed into an extremely beautiful young lady. 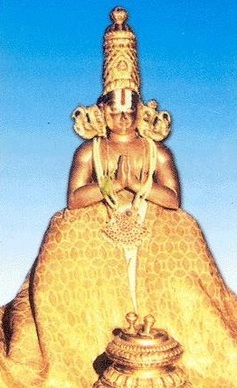 Later, during a festival, the Pallava king saw her in Āḻvār's place and married her. After some years, when the king actually noticed that his queen is not aging and has got the same youthful look while he was getting old, he found out that it was Āḻvār's divine blessing that did the magic. He asked Kanikaṇṇaṉ who was summoned to the court to make a request to Āḻvār on behalf of the king. Kanikaṇṇaṉ refused saying he and the Āḻvār will not yield and sing for a mortal. That enraged the king and he ordered to banish Kanikaṇṇaṉ from his kingdom. Kanikaṇṇaṉ said "this is not the only sthala for me; The entire world is His" and walked off. Āḻvār felt very sad that his dearest friend and disciple is leaving him. He did not feel like staying there without Kanikaṇṇaṉ. Hence, Āḻvār too decided to leave Kānchīpuram. "Kanikaṇṇaṉ is leaving Kānchī. O, Lord; I am also leaving with him. You don't have to lie down here anymore; since, as the fluent poet that I am also leaving with him, you also roll your serpent bed and follow me!" And, accordingly all of them left Kānchīpuram." The king next day got the news that the temple is desolated and the entire city looks dark and lifeless, he understood his folly and rushed immediately to chase the trio. He caught them on the way and prostrated on the ground, repenting for what he had done; requested them to forgive him for his mistake and to come back to Kānchī. Āḻvār and Kanikaṇṇaṉ, understanding the sincerity of his regret and repentance requested the Lord again to return and stay at Kānchī. "Kanikaṇṇaṉ has changed his mind and rescinded his decision to leave Since, as I, the fluent poet am also returning with him, You may also return and lie down on your serpent bed as before." All of them returned accordingly and Kānchīpuram regained its lost glory. One day, when on his way to Tirukuṭantai, he stopped for a while for rest and he sat on a pail of a house in Perumpuliyur. A few Brahmins were reciting Vedas. On seeing him, they stopped their recitation since Veda was not to be recited in the presence of a stranger. The Āḻvār understood and was about to leave when the Brahmins started their recitation. They did not remember at what point they had left the recitation. The Āḻvār broke open a paddy seed with his fingernail to indicate the exact context, which had a reference to the paddy seed. The Brahmins realized the greatness of the Āḻvār and begged to be excused. When the priest of the local temple wanted to honour the Āḻvār, knowing very well his bhakti and jñāna, some people objected and spoke ill of the Āḻvār. "What is the use of your having those resplendent hands if you cannot remove the idiosyncrasy of these ignorant folk and make me powerful in their midst? O’ Lord with the divine discus in your hand! Teach these fools a lesson by showing yourself appearing in my very body"
The Lord showed himself off in the body of Āḻvār and the onlookers were astonished and begged forgiveness.